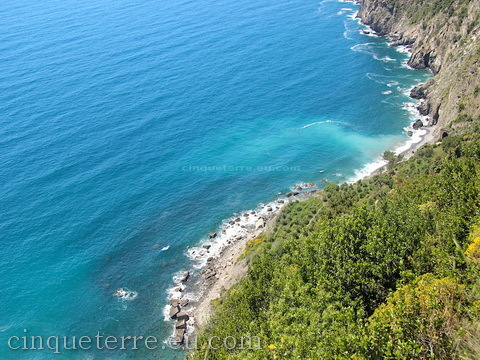 You can swim in the beautiful blue water of Cinque Terre from May until October. All along the coastal line there are rocky outcrops, harbour quays and sloping pebble beaches covered with eager bodies basking in the sun or enjoying a cooling swim in the clear water. Monterosso has a long sandy beach situated in the new part of the village. This is the perfect place if you are looking for a traditional beach with sand and umbrellas. You can either choose to pay for an umbrella and a chair or settle in a free area with your own towel. Along the promenade you'll find restaurants, pubs and ice-cream shops. 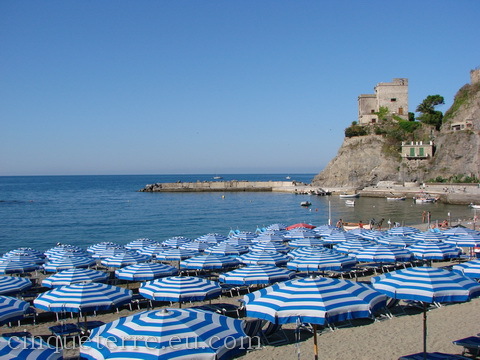 To reach the beach take the train that goes between the Cinque Terre villages and you'll find the beach right in front of the train station in Monterosso. 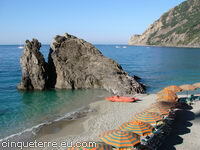 This beach is situated in the old town of Monterosso where also the trail to Vernazza starts. It's a sandy beach near the boats rental area and is divided into public and private zones. From the train station turn left and walk along the promenade in direction old town, pass the tunnel and you'll see the beach on your right side. 10 minutes walk. 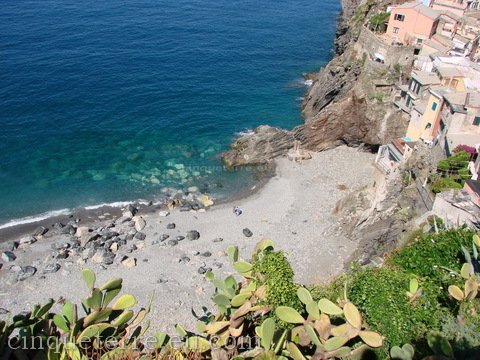 In the harbour of Vernazza there is a small sandy beach where you can take a swim and there are also flat rocks that are great for sunning. The natural harbor surrounding the beach allows the water to remain calm and creates a great place to protect the local's fishing boats. From the railway station go along the main village street in direction harbour, 2 minutes walk. This is a stony beach on the east side of the village. From the main village street turn left through the "cave", 2 minutes walk. 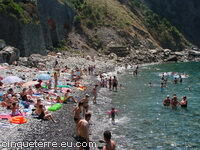 One of the least crowded is the Guvano beach near Corniglia. 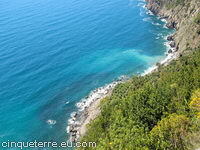 If you hike the trail between Vernazza and Corniglia you will find a sign Spiaggia Libera, which means Public beach. 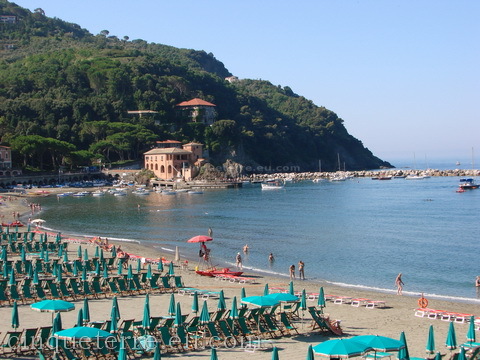 The Guvano beach is known to be a nudist beach and is usually very quiet and peaceful. 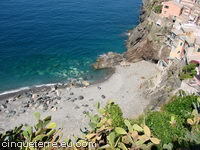 A particulary long expanse of pebble beach can be found by Corniglia railway station. Although there is no traditional beach in Manarola, there is a beautiful harbour area that have the best deep-water swimming around. A ladder up the rocks and a shower are provided for those who love a little adventuresome swimming. From the train station proceed in direction harbour, 3 minutes walk. In Riomaggiore there is a public beach of boulders with crystal water east of the village. From the railway station follow the tunnel and the sign to "marina". Visit the lovely harbour and take the stairs to the left and it will wind around to the ferry dock. Just past there and you will reach the stony beach. 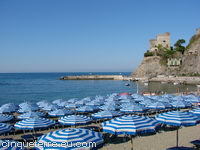 In Levanto you will find a beautiful and relatively long beach which is rather uncommon for this area. 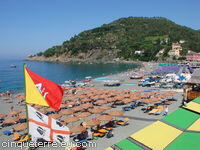 The small town of Levanto is situated just north of the Cinque Terre and only 3 minutes with train from Monterosso. From the train station follow Corso Roma and in 10 minutes you will reach the beach. It’s a sandy beach ideal for all sorts of activities. It’s divided into public (free) parts and private parts providing a range of services such as bars, outdoor pool, deck chairs, umbrellas, showers etc. You can rent canoes, peddle boats, motor boats and surf boards by the hour or for the whole day. The charming bathing resort of Bonassola has one of the most extensive beaches in Liguria. The beach is mainly sandy, mixed with small pebbles and the crystal clear blue water invites to swimming and snorkeling. There are three private zones with bars where you can hire deck chairs and umbrellas. There are also two large open public areas where you can put your own umbrella. 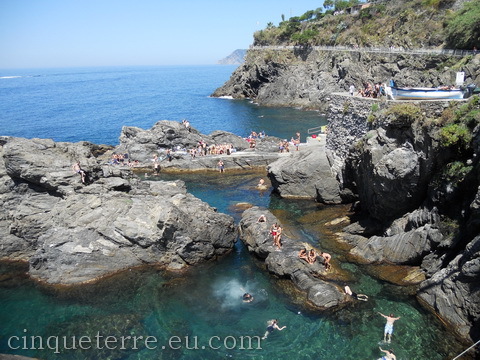 You can reach Bonassola with train from the Cinque Terre (5 minutes from Monterosso) or you can walk from Levanto through the tunnels. From the trains station you will reach the beach in only 2 minutes.